Tamaño desta vista previa en PNG do ficheiro en formato SVG: 800 × 400 píxeles. Outras resolucións: 320 × 160 píxeles | 640 × 320 píxeles | 1.024 × 512 píxeles | 1.280 × 640 píxeles. 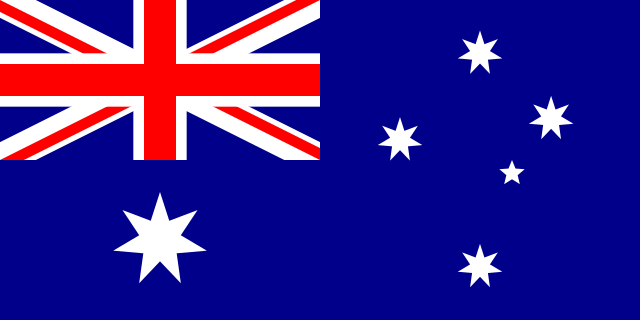 English: The flag of Australia. Français : Drapeau de l’Australie. Esta imaxe vectorial foi creada con Inkscape. , or something else. Flags are often specified with either Pantone or CMYK colours (for printing), for which the corresponding RGB screen colours are often a "best guess" (as was the case on previous versions of this image file). This version uses the official RGB colours as specified in the Australian Government's Style Manual for Authors, Editors and Printers. Please see the talk page for more discussion about the flag colours. Calculated via BC (Arbitrary Precision Calculator) to 50 decimals, rounded to 42 decimals. Resulting image can be accurately scaled to the size of the known universe. See Image:Flag of Australia (converted).svg for the flag in colours matching this chart. 24 de febreiro de 2013 ás 09:45 1.280 × 640 (2 kB) Zscout370 More precise stars; the diameter of the stars didn't fit in the 3/5ths circle as stated by the construction sheets.